Once you begin to discover succulent plants to grow in your home or in your garden, it is time to leap into the pool of plant taxonomy (the naming of plants). The purpose of plant names is to organize the world of plants. Most of the succulents have 2 types of names: common and scientific. Among succulent enthusiasts, common names are more often used instead of scientific names because common names are more natural and easier to remember. However, you may sometimes find a newly cultivated or discovered succulent without a common name. And some different succulents with same common names or one succulent with multiple common names. In such cases, it is helpful to at least know and understand the scientific names. The genus and species names together comprise the scientific name that every succulent is given when first described by a scientist. These species names are recognized by botanists, horticulturists and gardeners no matter where you go in the world. A botanical name consists of 2 words and is therefore referred to as a binomial name. The first word of the name identifies the genus (the first letter should be capitalized) of the plant and the second word identifies the species within the genus (not capitalized). The whole name should be italicized. The genus name can be used alone when discussing a group of succulents, but the specific epithet is never used by itself. Once the genus has been used in a paragraph or is understood, it can be abbreviated, such as C. ovata. An unspecified (or unknown) species in the genus Crassula would be written as Crassula sp.. To denote more than one species in the genus, it is written Crassula spp., with 2 p’s. In more publications there may also be a person’s name after the genus and species, the last name of the person that described the plant. If another scientist later decided that plant really belongs in another genus, then the original author’s name is placed in parentheses and the person who changed the classification follows. Trinomial name of a succulent is similar to binomial name but more specific on the rank of species, namely subspecies, variety and cultivar. A subspecies is a geographically separate population within a species that is almost, but not quite, a separate species. The subspecies name is not capitalized and preceded by the abbreviation “subsp.” or “ssp.”. The abbreviation is not italicized (although the subspecies name should be). Varieties often occur in nature and most varieties are true to type (seedlings grown from a variety will also have the same unique characteristic of the parent plant). The variety name is not capitalized and preceded by the abbreviation “var.” or “v.”. The abbreviation is not italicized (although the variety name should be). Cultivar means “cultivated variety” and may not be true to type. They are selected and cultivated by humans. The first letter of a cultivar is capitalized and the term is never italicized. It is preceded by the abbreviation “cv.” or placed in single quotation marks. The abbreviation is not italicized. Sometime you may see plants come with more than 3 parts in their scientific name. 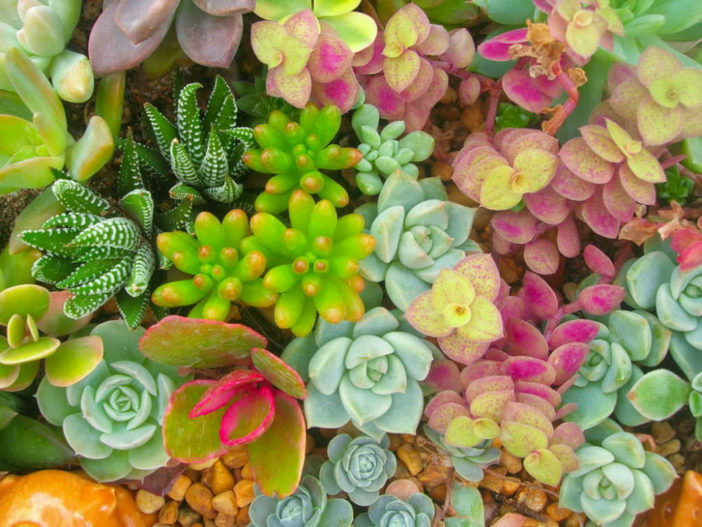 With succulents, they are usually 3 different forms: variegated, crested and monstrose. Variegation is the appearance of different colored zones in the leaves or stems of the plant. Variegated succulents have their names followed by “f. variegata” or “forma variegata“. The abbreviation “f.” and the word “forma” are not italicized (although the word “variegata” should be). Crested or cristate form is a rare mutation of abnormal growth in a plant that produces elongated or flattened tissue. The binomial name is followed by “f. cristata” or “forma cristata“. The abbreviation “f.” and the word “forma” are not italicized (although the word “cristata” should be). A monstrose mutation is even more distorted than a crested one. It usually involves all the meristematic tissue in a plant and results in a club or cylindrical-like shape or sometimes uneven surface. This is more common to cacti. The binomial name is followed by “f. monstrosus” or “forma monstrosus“. The abbreviation “f.” and the word “forma” are not italicized (although the word “monstrosus” should be). Hybrid is breeding plants to create new varieties and to improve old ones. It’s especially popular with Echeverias. The parent flower that furnishes the pollen is called the pollen parent and the one that bears the seed is called the seed parent. Seed parent always come first and pollen parent comes second and the symbol “x” is put between them and it is not italicized. As taxonomists study plants, they sometimes conclude that a plant is named incorrectly and belongs to a different genus or species. An example is Lace Aloe (Aristaloe aristata). Now listed as part of the Aristaloe genus, it was previously, and still is, in some cases, known as Aloe aristata. If you see 2 names listed for a succulent in a catalog or on a website and you plan to look for the plant at a local garden center, be sure to record both names. Sometimes grower nurseries have a stock of plant tags on hand, and they will use what they have, which might list an older name. While it is quite appropriate to use common names when everyone knows what you mean, often it is much better to use the proper scientific name. By their very nature, common names are only given to common succulents. But common where? Succulents common in one place aren’t common in another. Also, many succulents have more than one common name. Some common names are used to refer to several different species. And finally, some succulents, especially those that are rare, don’t have common names. Therefore common names are not as reliable as botanical names for identification purposes.